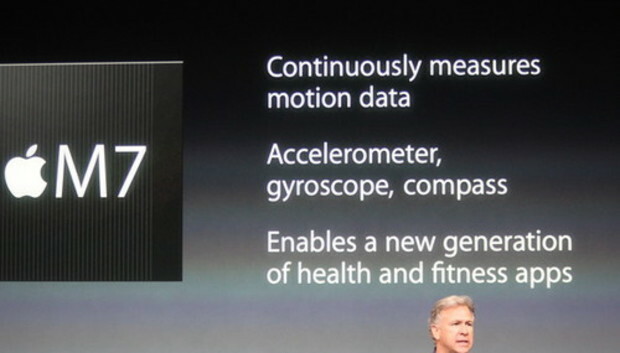 Don't panic: Apple didn't forget to put its much-fussed-over M7 coprocessor into the iPhone 5s. Earlier today, iFixit was unable to locate the new chip, which Apple said is responsible for handling data from the smartphone's many sensors, but further investigation by Chipworks has located the elusive piece of silicon. The confusion apparently stemmed from the fact that the M7 isn't physically branded as such. Rather, it's labeled as the NXP LPC18A1, from a company called NXP Semiconductors; that firm specializes in, among other things, microcontrollers. The "M7" designation seems to simply be Apple's marketing branding for the chip. Chipworks uncovered one additional tidbit from its investigations: Despite many rumors to the contrary, Apple's A7 chip is still being produced by Samsung. Prior to the release of the iPhone 5s, it had been speculated that the Korean-based company--which Apple has increasingly found itself at odds with--might be replaced by another vendor, such as the Taiwan Semiconductor Manufacturing Company (TSMC). If detailed looks at semiconductors and smartphone components is what gets your engine revving, be sure and check out Chipworks's full look at the iPhone 5s.